The true price of climate-smart agriculture (CSA) coffee from Mexico is $ 4.30, which is lower than the conventional coffee from Mexico. 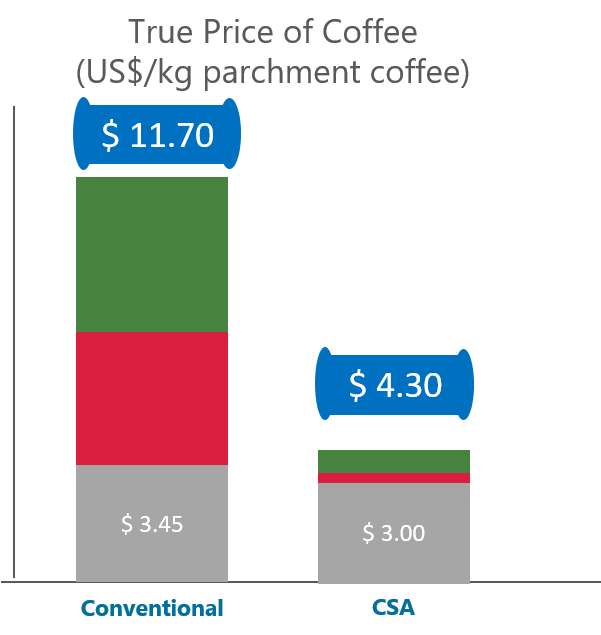 Conventional coffee has a true price of $11.70 per kilo of parchment coffee. Description: True Price used the measurement framework of true pricing and true return on investment to quantify the impacts from a cost-benefit perspective. The True Price study demonstrated that climate-smart agriculture (CSA) is more sustainable in terms of environmental costs. At the same time, It also contributes to a decent livelihood for farmers.